Edited by Jerome Rothenberg and Pierre Joris. I abandon sculpture engraving and painting to dedicate myself entirely to song. When Pierre Joris and I were compiling Poems for the Millennium we sensed that Picasso, if he wasn't fully a poet, was incredibly close to the neighboring poets of his time, and when he brought language into his cubist works, the words collaged from newspapers were there as something really to be read. What only appeared to us later was the body of work that emerged from 1935 on and that showed him to have been a poet in the fullest sense and possibly, as Michel Leiris points out, "an insatiable player with words ... [who, like] James Joyce ... in his Finnegans Wake, ... displayed an equal capacity to promote language as a real thing (one might say) . . . and to use it with as much dazzling liberty." as one of us has tried to phrase it in translation. Yet if the poems begin with a sense of personal discomfort and malaise, there is a world beyond the personal that enters soon thereafter. 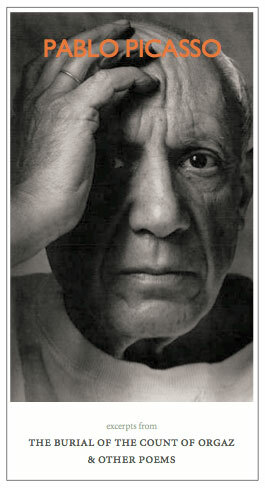 For Picasso, like any poet of consequence, is a man fully into his time and into the terrors that his time presents. Read in that way, "the world smashed into smithereens" is a reflection also of the state of things between the two world wars - the first one still fresh in mind and the rumblings of the second starting up. That's the way the world goes at this time or any other, Picasso writes a little further on, not as the stricken husband or the discombobulated lover merely, but as a man, like the aforementioned Joyce, caught in the "nightmare of history" from which he tries repeatedly to waken. It is the time and place where poetry becomes - for him as for us - the only language that makes sense. That anyway is where we position Picasso and how we read him.